I saw a post opportunity and I took it. Also, it's Friday!!! And there's gossip. 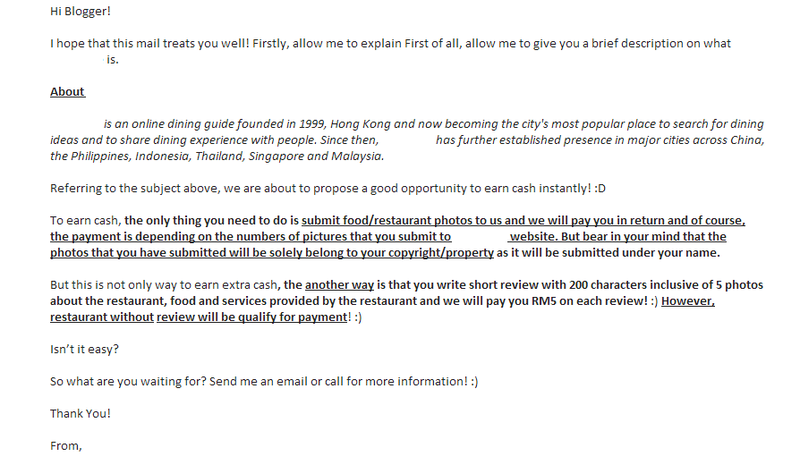 I received an email from a company offering a small fee for a 200 character (please note: character, not word) review with 5 photos. *All names of bloggers, email addresses, and the company name is not shown to avoid future legal actions, which you will read about in the pictures below. The first email received. Sent to 300+ people, with all emails visible to everyone. Date and time of email is incorrect. Gmail screw up I suppose. 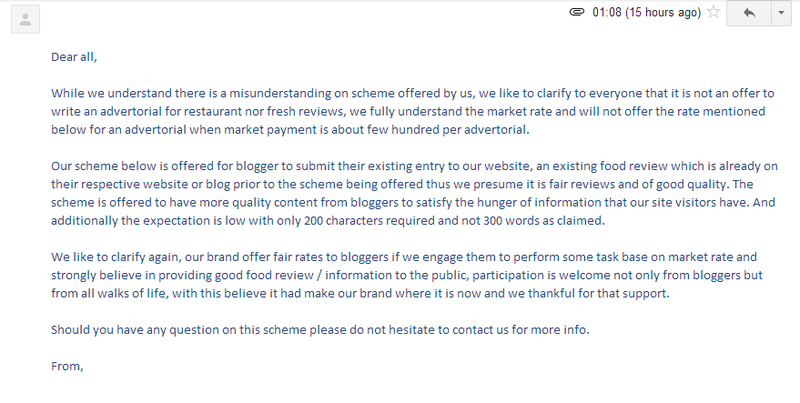 And a final clarification email from the said PR/ company. 1. PRIVACY is so important to a certain blogger that when "they" reply to all, "they" forgot "they" also spread the emails of everyone to everyone. just because someone did it first doesn't give you exemption from being punished, you're just an accomplice. Since the person's blog does take money in exchange for blogposts, does it mean said blogger can be charged under the same act which "they" have brought up? 2. 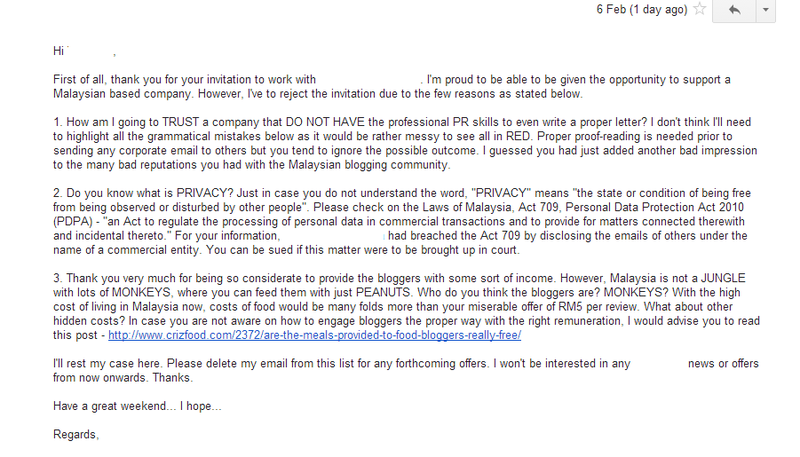 No point attacking the person for her PR skills because it does not affect the recipient of the email in any way. 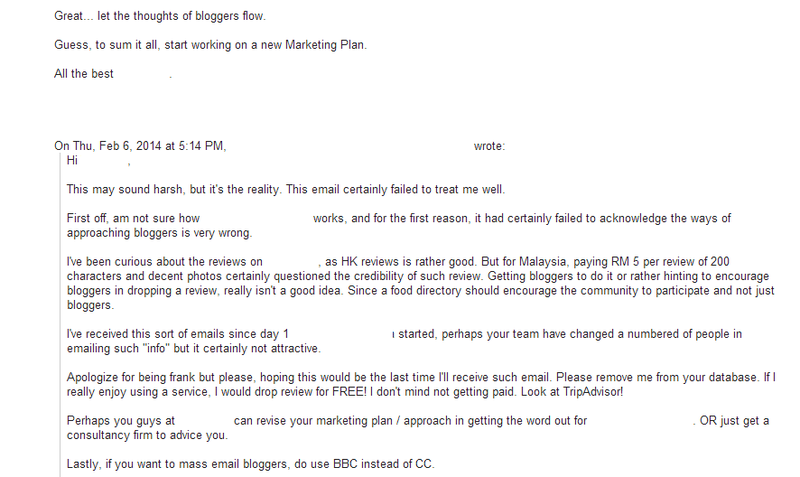 I don't think anyone will be terribly affected after reading an email with errors. It just affects the company's reputation, which is none of our business. 3. Grammatical mistakes happen, even for people who are very careful. Before you point out the mistakes of others, please make sure that you constantly practice near perfect grammar. I sent out an email about this incident, proof-read it before and after lunch, and yet there was an error. 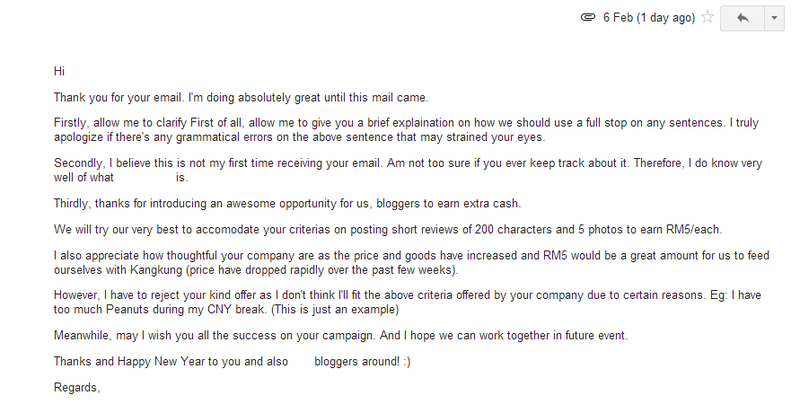 (If anyone received the email noticed) I didn't realize until a fellow blogger pointed it out to me (in private). 4. Just because you think someone isn't professional enough, doesn't mean you have to stoop low. Being rude to someone who is not rude to you but angered you because of something out of the person's control, is stooping low. 5.Exposing P&C information, especially when you know it's P&C reveals how much a professional you are. NOT. 6. For the final angry reply: Most of the recipients have acknowledged and understood the company involved gives bad rates. So what is the purpose of that angry reply? To show off that you've worked with many companies and have considerably high traffic? 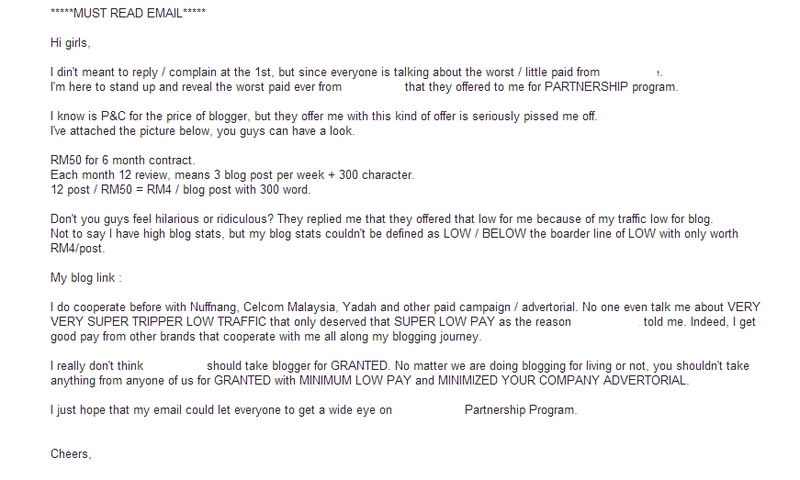 Mind you, there are bloggers in the list who are more popular and did not rant about all that. Or are you just captain obvious in disguise? 8. If you're unhappy with the payment offered by an organisation/ company/ or even an individual, ignore it, reject it, add them into a blacklist and spread it among your friends. Giving the PR a hard time doesn't get you anywhere. It just shows what kind of person you are (psst... Not a nice one). p.s. Constructive criticism is very welcomed. Those who are burned, too bad.